Transiting Rahu and Ketu are trine to their natal positions and square to natal Mangal, the lord of his tenth house of success. 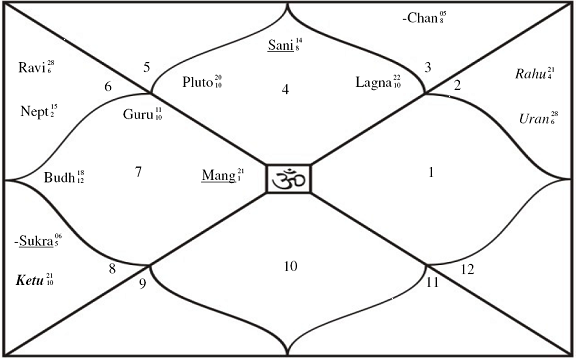 Rahu passes through his seventh house of partnerships. He is under the influence of Mangal Antardasha in Budha Mahadasha. Ganesha finds that Mangal, his Yog Karaka planet is ruling as per the Vimshottari Dasha system. This alone his enough for him to lead his party to a spectacular win in this election. Shani a Marak planet for him passes through the second house and aspects the eighth house. Shani also as the lord of his seventh house of partnerships is weak in the second house, in its current transit. Rahu is passing through the seventh house. This denotes that he will not associate with any party before and after elections and will be able to win the elections and form the government in Orissa on his own. If at all need be, he will take some support of very small parties or independents. Summarily Ganesha is of the opinion that Naveen Patnaik will strongly advance all alone this time and show it to the people that he Can DO IT. Wishing him good luck and may Lord Ganesha bless him.